100% Saturday for the juniors (U12's upwards) …..
A great day for the junior section with all the teams we can report on winning, as usual we cannot report the results or scorers of our youngest age groups but for information our U9’s and U11’s were both at home with the 9’s playing Millmoor and the 11’s playing Charnock Ridgeway. Our U10’s travelled the short distance to play Ecclesfield Red Rose. Our U12’s travelled to Dearne & District and had a very tight game eventually winning 2-0 after being 0-0 at the break. Matilda Rodgers scoring two goals to win the game but a great performance from all the girls on both teams. There was a hat trick of games and wins against local rivals Barnsley with our teams taking all of the points. Our U13’s won a close game at Bawtry road 2-1 after the half time score had been 1-1. Scorers: Millie & Tamsin Stephenson. 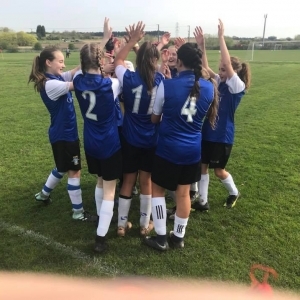 The U14’s put an end to Barnsley’s dominance in their division, our girls lost just three games last season in the league and cup all to this team but finished comfortable 10-0 winners away from home after being 4-0 up at the break. To be fair Barnsley have lost some players this season but still a great achievement for our girls. Hat tricks for Lily-May Beevers and Brooke Betts, Ella-May Buitcher, Mollimae Sterland, Madison Wilson & Maisie Brennan. Our U18’s completed the clubs three victories over the Tykes with a 5-1 win away at Barnsley. Hannah Jackson with a hat trick, Katrina Bennett and Courtney Livesy were the scorers on the day. No game this week for our U16’s but Last but not least our U15’s were involved in their own derby against Sheff Utd white. They came home with all three points after a 3-0 victory with scorers Erica Flynn, Neve Renwick & Charley Taylor.